FOR the first time in history there are more democratic states in the world than autocracies, but democratic culture is still in short supply. Unless it grows in right proportion, democratic order may not thrive and blossom forth in every nook and corner of the globe. Democratic culture is indeed the life blood of democratic system. Both should go together. Look at the 2001-2002 Survey of Freedom House report, you will find that at this point of time in history more than 65 per cent of the world's population live in free or partly free states. It has shown that of the world's 192 states (members of the UN) 121 (63 per cent) are electoral democracies while in 1987 only 66 out 167 states (40 per cent) were in this category. According to one estimate of the UNO, 81 countries of the world have taken significant steps in democratization of their political system since 1980, with 53 military regimes replaced by civilian governments. There has been largescale replacement of military dictatorship in Latin America, emergence of new democracies in Central and Eastern Europe and establishment of democratic regimes in Africa, South and South-East Asia. The progress has been slowest in the Middle East in the Arab World with only four out 17 countries with multi-party electoral systems. Democratic order came back, as suggested ably by Huntington in his The Third Wave: Democratization in the Late Twentieth Century, in such countries as Pakistan, Nepal and Bangladesh in South Asia during the last decade of the last century. The growth of democracy is however not unilinear in the sense that it goes on developing. The wheel of democratic order turns back if democratic culture fails to keep pace with it. In the 1990's some such new democracies as Sierra Leone, Belarus, Cameroon, Uzbekistan, Pakistan, have, instead of having stabilized, reverted to authoritarianism. Quite a good number of new democracies are fumbling and faltering, and some of them quite dangerously dangling near the crevice of authoritarianism. How one can explain this phenomenon? Linz and Stepan (1996) have argued that for stability of democratic order in a society five inter-related conditions must be fulfilled: (a) a free and lively civil society; (b) a relatively autonomous political society; (c) rule of law guaranteeing citizens' rights and independent associational life; (d) an institutionalized economic society; and (e) functioning state bureaucracy. But as I feel and feel very strongly that above everything else democracy becomes consolidated is a society in situations where "those competing for power play by its rules". In other words, democracy becomes stable only if it is ably supported by democratic culture, which is another name for rules of the all important political game. If the political activists do not go by rules of the game, the prospects of stabilization of democratic order are dismal and bleak. Bangladesh is one of those new democracies where democratic culture is yet to strike deep roots into the social soil. Institutional framework has been created, but these institutions have not been vibrant with life forces. Scores of political parties exist in the country, but all of these are organized on feudal lines rather than democratically, thus creating ample opportunities for personalized power for the party bosses. The Jatiya Sangsad, comprising members directly elected by the people, exists in Bangladesh, but this is yet to be the centre-piece of national polities. Most often the crucial decisions affecting interests of the people are taken outside the Sangsad. The ministry consisting of the representatives of the people operates here but the principle of ministerial responsibility is not in sight. Local government has not yet been functional in the country and most often the local governing bodies are working as support bases of the sitting government. True it is that Bangladesh has achieved some success during the last decade. The institution of election has been rehabilitated at last in 1991 as the mode of peaceful transfer of power to the victorious party or parties. This has been institutionalized through the Non-Party Caretaker Government for conducting the general election. A few conditions which are essential for effective functioning of democratic government are either fulfilled or are in the process of being fulfilled. The press is more or less free. Attempts are on to institutionalize the independence of judiciary. The civil society is being lively day by day. Despite all these, the political situation seems to slide downhill. 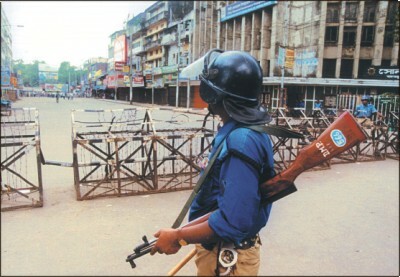 Even after three decades democracy in Bangladesh exists mainly in hope rather than in reality. To most people of this country, democracy is more like a rosy ideal an aspiration cherished by the people in the thickets of big money and muscle-oriented political exercises, dominated by a small group of privileged ones. The argument of force has not yet been replaced by the force of argument. Democratic culture, which helps build consensus among the politically relevant social sectors including the political parties, is yet to get off the ground. Tolerance among the political activists is conspicuous by its absence. The consensual approach involving mutual give and take, being respectful to one another's views and the overriding concern of the majority party to work together with the minor ones is yet to be effective. The party in-power tends to ignore the opposition and the opposition goes on opposing anything and everything the party-in-power proposes. Politics, in consequence, has been confrontational and the social forces have been fragmented and divided, thus making it very difficult for any government to build consensus behind any developmental agenda. When politics becomes confrontational, partisanship becomes intense. That leads to immunity for the party followers even for their worst excesses and corrupt practices, and vengeance to the opponents. Since the Jatiya Sangsad fails to absorb the demands of the members of the opposition political parties, politics comes down to the stormy streets in the form of processions and demonstrations. Occasional hartals keeps the shops, work centres, business houses, offices and educational institutions closed, thus affecting law and order in the country seriously. Politics in the process gets transformed into power-politics and democratic values get dissipated. In new democracies, distorted democratic culture affects both the polity and political activists. Polity becomes power-oriented in the sense that power turns out to be the motive force at every layer of administration. The political activists, on the other hand, become motivated to use political power as the medium of power, influence, and in some cases property for mobilizing more power in their baskets. In Bangladesh, democratization has taken the form Prime Ministerial leadership. In the developed West, Prime Ministerial leadership is based on collegial equality. Prime Minister is the team leader Primus inter pares first among the equals. He rules because both of his colleagues and counterparts allow him to rule. He has no right to command. He acquires it daily by his work and prestige over his colleagues. In our country the Prime Ministerial leadership has given rise to strong executive leadership. The Prime Minister is not only the head of the government but also the head of the party, resembling authoritarian executive. Since there is very little trust in the system, nobody trusts anyone and everyone looks to the Prime Minister not only for guidance but also for shelter thus leading to hierarchical, position-based leadership, making "him or her monarch of all he or she surveys". Democracy by any definition, is a limited government limited by the rights of people and by normative overtone of democratical culture. When democratic culture gets distorted democratic government loses much of its salt and comes closer to what we have seen in Bangladesh during the last decade a government by the Prime Minister with the help of a limited number of confidants mainly to serve the predetermined interests of a small group rigidly bound together by the cements of petty personal goals. Democratic culture, which keeps democratic order vibrant, is lifeless not only in the polity of Bangladesh but also the political parties, both in position and opposition. Author is former vice-chancellor, Dhaka University, and advisor caretaker government.